Getting into the driver seat of an 18-wheeler feels empowering. As a truck driver, you have control of a 73’-long, 102”-wide, 13’6”-high and 80,000lb semi-truck. But with that power comes the responsibility to put safety first and always. Practicing safety is vital, even when it comes to completing the most frequent tasks as a driver, like making left turns. Making a left turn while operating a noncommercial vehicle is something we do daily with very little thought. While it’s one of the most routine tasks a commercial driver performs day-to-day, it’s one that takes a lot of practice. For truck drivers, left turn accidents most commonly occur on the driver’s side of the vehicle when the turn is taken too quickly. 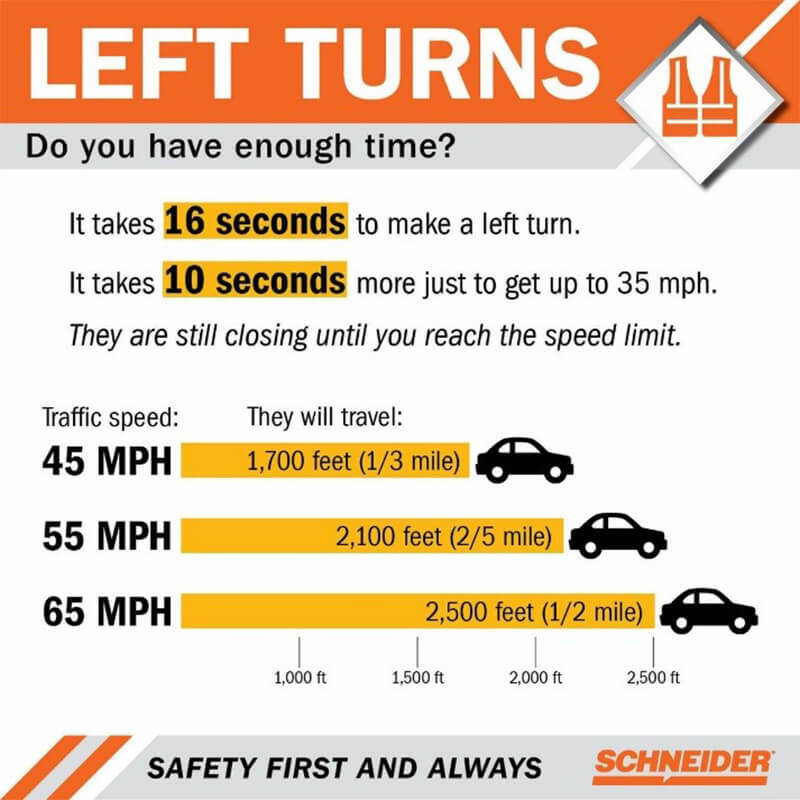 At Schneider, we provide ongoing extensive training with our drivers so they are prepared for the different scenarios that happen while making left turns out on the road. It is just one way we emphasize the importance of safety. First and foremost, it is important for drivers to make sure they have enough time before making a left turn. While driving a semi, it takes 16 seconds just to make the turn and 10 seconds more to get up to 35 mph. Make sure the gap between you and oncoming vehicles is big enough to turn safely; don’t try to force others to slow down or stop for you. One of the most important things to practice before and during a left turn is patience. Sometimes there will be obstacles that prohibit drivers from immediately making a turn. If there is a car in the path of the tractor, the driver must wait to turn until the car moves. Are you in the correct lane? If not, get there. This is not optional. Turn on your signal at least 100 feet before the turn. Ideally, the turn should not be taken faster than 10-15 mph. If your container is top-heavy, it should be closer to 10. This is the most important step. Drivers need to remember to look near and far. Double check at night and be extra careful by looking for smaller vehicles like motorcycles. Anticipate that other traffic may be exceeding the speed limit, which reduces closing time. Other things drivers need to ask themselves while surveying: Is this a buttonhook turn? Is this the correct road? Are there signs (lane signs, caution signs, ‘No Truck’ signs, low clearances, etc.)? What is traffic doing before and after the turn? Is the traffic light green? Can I see around the turn? Are there lanes blocked around the corner? … into and through the turn. Keep the right side of your tractor close to the outside edge of the lane you are turning into. You have two main areas of focus: the road ahead of you and your left mirror. Both are vitally important when making the turn. Cancel the turn signal after both the tractor and trailer are straight in the lane you are turning into. We invest in our drivers. 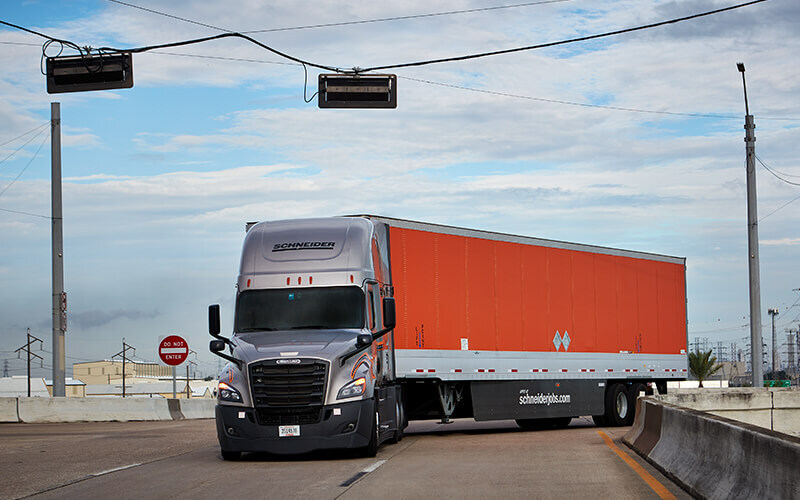 From having extensive training to providing the newest equipment, we put our drivers first so they feel confident and safe while out on the road. See what kinds of technology we are implementing in our trucks to promote safer driving. Allie is currently a Curriculum Development Specialist at Schneider. She started with Schneider in September 2018 and is a graduate from the University of Wisconsin-Oshkosh. In her free time Allie enjoys running, yoga, reading and photography.